So it’s perhaps no surprise that there is a certain following for these classic trucks today, though like with most other collectibles, a specimen in good condition can be prohibitively expensive. The truck that [PoppaFixIt] found in the trash was certainly not one of those specimens, but with some patience and knowledge of basic chemistry, he was able to bring this vintage toy back to the present. The first step was to disassemble the truck. Before they switched over to Chinese mass production, these trucks were built with actual rivets. After drilling them out and unfolding the little metal tabs that toy makers loved back in the day, he was able to separate the metal body of the truck from the plastic detail bits. The plastic parts just needed a fresh coat of paint, but the rusted metal body would need a bit more attention. Remembering a tip he read online, [PoppaFixIt] decided to attempt electrolytic rust removal to get the metal parts back into serviceable condition. 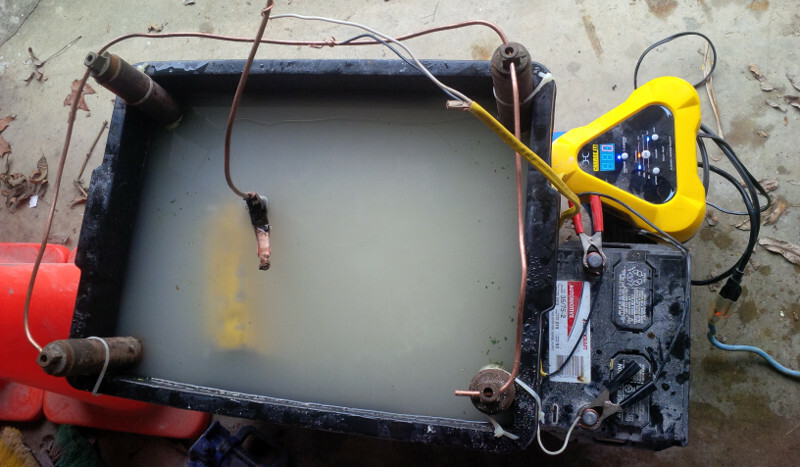 A big plastic bin, some washing soda, and old steel window weights for his sacrificial anodes was all the equipment he needed for the electrolysis tank. To power the chemical reaction he used a standard 12 volt car battery and charger wired in parallel; this step is important, as he notes most newer chargers are smart enough not to work unless they see a real battery connected. After running the setup overnight, the collected rust and junk on the window weights was proof enough the process worked. 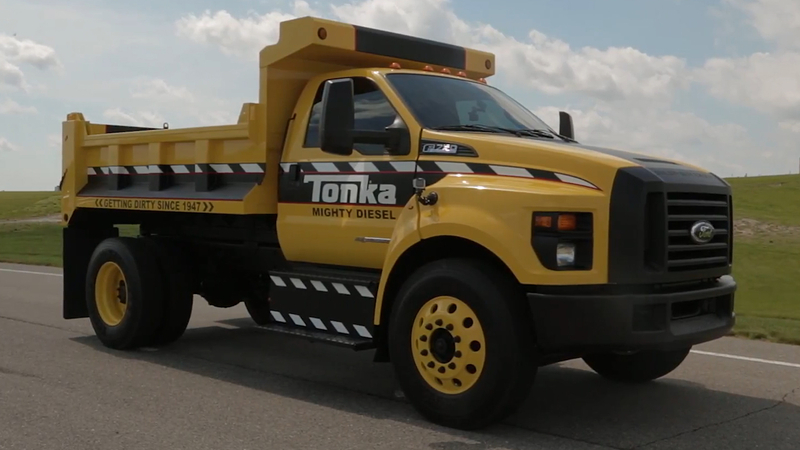 From there, it was just a fresh coat of yellow paint, a new sticker kit from eBay, and his Tonka truck was ready to face another 30+ years of service. If you’re looking to restore things larger than a child’s toy, you may be interested in the much larger electrolytic setup we’ve covered previously. Of course if you’re really pressed for time, you could try blasting the rust away with a laser. My mom got rid of those out of the basement under my protest–“you’re too old for these!” along with the Buddy L trash truck with working piston for the bed and pristine Nylint Michigan Crane. These would have dated from the early seventies. Dare I say: You’re not really wishing for your trucks, you’re just wishing for more money. (Shrugs) I feel ya. 99% of the money held by less than 1% of the population. Money does not make you rich. Knowledge is power. Power is power. Power is held by the ones with money, unless everyone else decides it isn’t anymore. That’s unlikely to happen cleanly. This. “Knowledge is power” is wrong. More accurately, valuable knowledge is a power multiplier. Knowledge that’s free or cheap to anyone is practically worthless as a competitive advantage – ability to wield all such knowledge just brings your knowledge multiplier up to average. Didn’t expect to see such deep comments on post about a toy truck. In the United States, the top 1% controls 38% of the wealth (CNN). I know what place you pulled 99% from. In the US the top 20% are paying for 95% of the income tax. Forget the money, I’d take the Tonka truck and go back to working in the sandbox 9-5 every day. Almost as much fun to be had by just pretending you’re a Tonka truck. Kids give me odd looks though as I trundle round the house chugging. I can embarrass them in so many ways. “There’s lots of model trucks, and model trailers too! the one that boys like so much! Just imagine the uproar is that were to be aired today. I never knew Tonka was a US brand, the name always sounded Japanese to me. I had a little green digger, left it on a bus in Oxford when I was about 5. A bit off topic, but since you mentioned the name, the Minnetonka did exist as a very large steamship that was built along with two sister ships, the Minneapolis and Minnehaha, in the very early 1900s. A fourth ship was to be the SS Minnewaska but funding ran out in 1901 so her superstructure was sold to the White Star Line who then renamed her the SS Arabic. All four ships were sunk by German U-boats during World War 1 with a great loss of life. “Tonka” is a native, I think Sioux, but I can’t remember the meaning, or why I know it’s a native word. Nice work. The finished articles looks good as new. A Labor of love. Thanks for sharing! Evapo-Rust is your best friend for complete rust removal with no damage to good steel. Would a DC stick welding box work to drive the electrolysis? I have heard of it done. My brother had the newer version of one of these, got it for his birthday after he tired of playing with my rusty old one from the 80s. One day he comes home in tears (He was 5 or 6 at the time) with his poor Tonka truck, smashed flat as a pancake. Neighbor kids thought it would be fun to drop a giant rock on it. I carefully took it apart, hammered everything back out as best I could, and put it back together. Didn’t look new, but was more than able to be played with since it’d roll and dump again. Brother thought I was a superhero after that. He didn’t say anything about the decals. I am going to assume he purchased them on ebay or something similar?